renowned food and drink experts. As is key to Sodexo’s excellent catering, the carte du jour was chock full of local Scottish produce; dedicated head chef Tom Beauchamp truly went above and beyond for the much anticipated event, hand-foraging both the wild garlic and elderflower for the menu himself. Check out the original press release here! 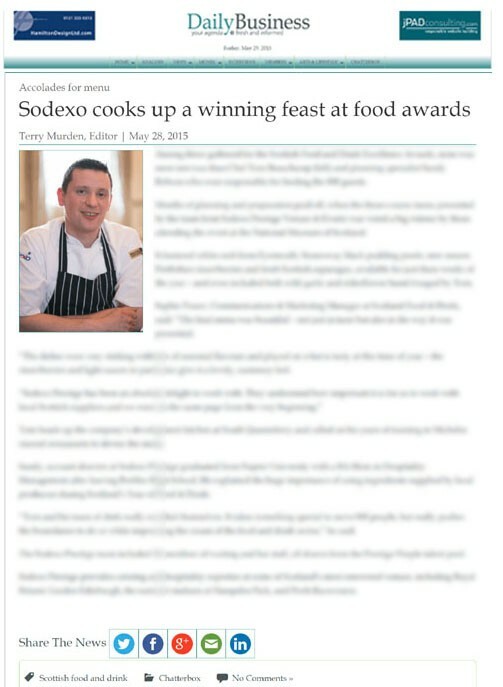 The meal went down a storm with the audience of food and drink connoisseurs who gathered at the National Museum of Scotland for the awards and was equally commended in the headlines, with widely recognised publications dishing up the success story. With the help of our Scottish PR agency, the story was served up by Deadline News and the Linlithgow Gazette, as well as business orientated sites such as Daily Business Group and All Media Scotland.